Quarktet is happy to announce GCLAD-In-a-Box, a low-cost ultrasound detection system, that can be purchased from us for use in proof-of-concept systems and laboratory research. 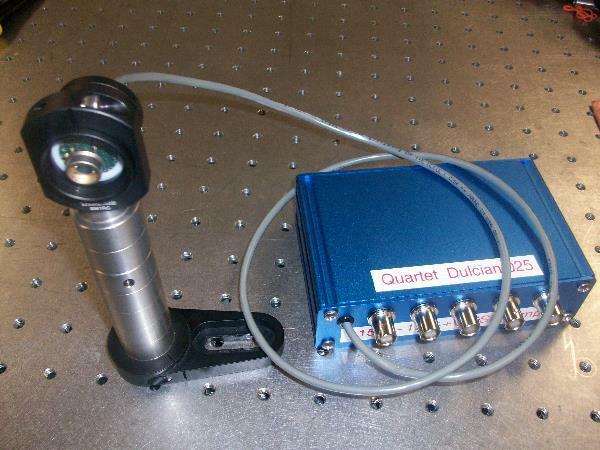 The system consists of the Quarktet Dulcian detector, a compact optics bench, and appropriate laser. The customized systems are built and tested here at Quarktet to fit your application. Figure 1: A tabletop version of the GCLAD-IN-A-BOX detection system. 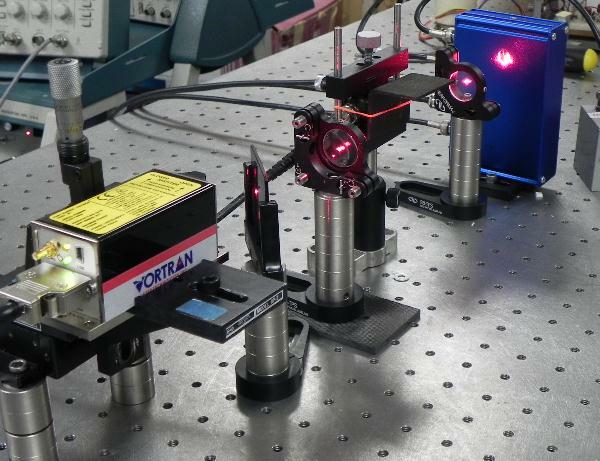 The laser light from a Vortan laser is directed past an angled composite sample, and to the Dulcian detector. In this case, a contact transducer, mounted on the reverse side of the composite, creates the ultrasound. The image above shows a configuration created for a customer. A contact transducer is mounted to a composite sample. The generated ultrasound travels through the material, and some of it becomes airborne. Light from the Vortan Stradus laser is directed through the region where the airborne ultrasound wave is expected, and is received by a Quarktet Dulcian detector. When completed, this system will be mounted onto a small breadboard which can then be put into a larger testbed. The estimated purchase price of this system is $3800, drastically less then what one would spend on an interferometer-based system. The sensitivity of the system is demonstrated below. Figure 2. The waveform was created by a 1 MHz contact transducer in the angled composite part, which then radiated a waveform. The deflection of the beam caused by the airborne wave was sensed by the Dulcian detector. It possesses high signal-to-noise and has a fundamental frequency of 0.928 MHz. In a second demonstration, an aluminum plate was placed on the opposite side of the beam of the sample. The purpose of the plate was to reflect the airborne wave through the beam, creating an ultrasonic echo chamber. As shown in Figure 3, the wave passes back and forth between the surface of the plate and the face of the transducer. 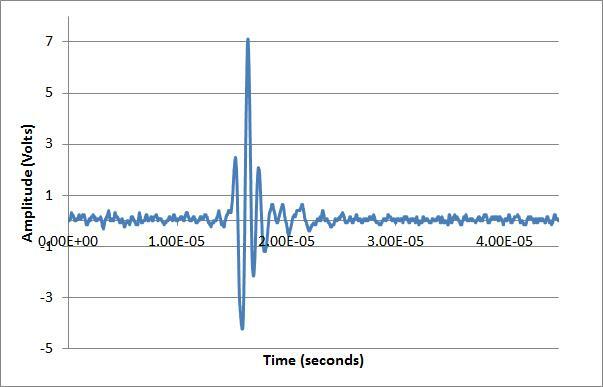 The graph shows 16 passes, with the last significant pass occurring at 0.412 milliseconds after generation. Given the speed of sound in air, the system could detect 1 MHz waveforms that have traveled as far as 14 centimeters away source. Figure 3: An aluminum plate was placed opposite the composite panel, as shown in Figure 1. The plate reflected the airborne wave through the laser beam multiple times. Attenuation in the air reduces the amplitude with each pass. 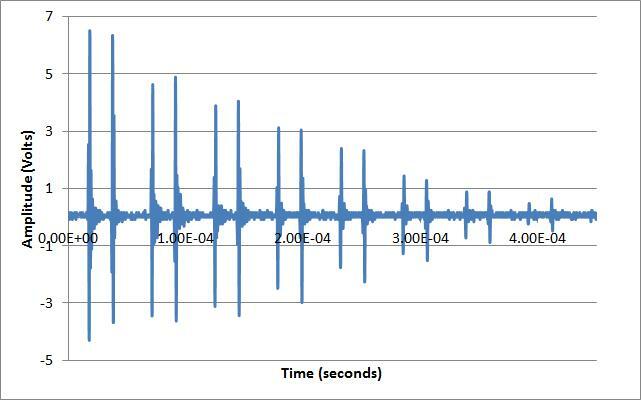 The last detected waveform was sensed 0.4 milliseconds after generation. In addition to the low cost and high sensitivity, this method requires very little maintenance, can be customized for any frequency range (below 10 MHz), and has no moving parts. Audio noise, which also affects the beam, is easily filtered out electronically in the Dulcian detector. Figure 4: Our latest Dulcian Photodetector for use in the GCLAD system. The Photocell is now mounted in a Thor Labs optical tube for easy installment and alignment in the GCLAD set up. This detector was customized for a bandwidth ranging from 50 kHz to 6 MHz. If you have an interest in acquiring your own GCLAD-IN-A-BOX, let us know!